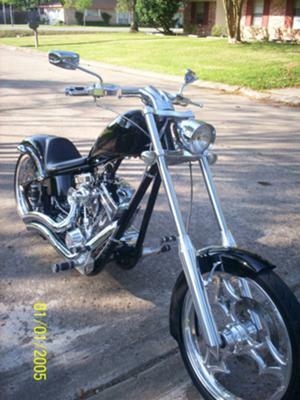 The 2004 BIG DOG CHOPPER for sale that you see in the pictures has a 107 S&S Motor with Compression Release Buttons,a 6 speed Baker transmission, a 250 Rear Tire and only 9,500 total miles. The custom chopper for sale is VERY CLEAN * VERY CLEAN * VERY CLEAN * VERY CLEAN * and has LOW MILEAGE * and you MUST SEE ~ MUST SEE ~ MUST SEE ~ MUST SEE~ MUST SEE to fully appreciate just how beautiful it is and how beautiful it sounds on the road. If you're interested in buying the custom chopper for sale you can reach me by e-mail using the comments form found directly below this classified. Strike Lightning also invites anybody who may be having any problems with a BIG DOG CHOPPER to leave their questions or describe the exact problem that you're having and your contact information in the space below and see if one of the chopper fanatics who stops by may be able to recommend a solution for how you can fix your bike. We also encourage bikers to submit their opinions and reviews of the 2004 BIG DOG CHOPPER for sale to help potential buyers make informed decisions and to benefit the biker community as a whole.